Capture EVERY detail of the best moments in your life thanks to a revolutionary technology of recording full picture of the surrounding world. Two lenses: that’s the WHOLE world, not just half! It was not possible before. A full picture of every situation: a family gathering, a weekend trip, business talks, partying in a club. Nothing will be left behind – you have everything under control. Two lenses (front and rear) capture 220 degrees, vertically and horizontally, creating an image of complete 360-degree field of view without the need of additional framing. Additionally, after connecting the camera to your smartphone thanks to WiFi and using VR glasses you will get a picture of a really augmented reality. You can choose between a Full HD video mode with 30 fps (frames per second) and “live” photo with 4.5 Mpx definition (3008x1504 px). Regardless of the circumstances you will be able to capture the smallest details of each recorded moment. Thanks to a WiFi you can see live the world behind you. The camera records sound too! 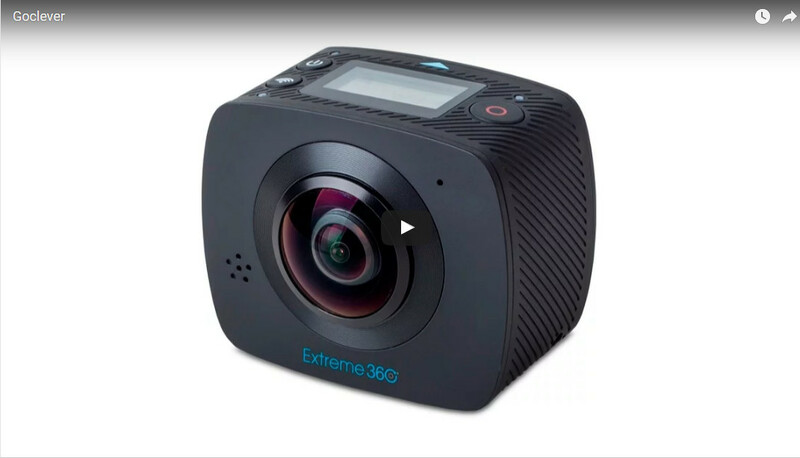 The picture from Goclever Extreme 360 camera can be added after a simple conversion to your Facebook profile or YouTube without any loss in quality or functionalities. Feel free to show off the full picture of your world. Extreme 360 can be easily connected with a smartphone using WiFi. For example, you can use the screen of your smartphone for a quick preview of recorded material and to control the functions of the camera. All that with an intuitive app for Android and iOS. There are no limits for Goclever Extreme 360. Thanks to a full set of dedicated accessories you have countless possibilities to use the camera. The set includes a mount for bicycle handlebars, a helmet mount, and a flat camera mount (to mount it on a table, windscreen, or car bonnet). The set includes a groundbreaking, multifunctional tripod. Its flexible arms mean it can work as a conventional tripod or a mount allowing you to mount the camera almost anywhere.